It’s great to be three-years-old. The world around you is huge and there are new things to learn every day! Your developing brain is taking in large amounts of information at a rapid rate and you can’t wait to be “big” and know it all. It’s also hard to be three. Because sometimes all that information can be a little overwhelming and hard to sort through. And sometimes you make mistakes that cause your parents to laugh out loud. Anna sees an object she has previously seen and heard the name of. Her brain attempts to retrieve the object’s name, but she can’t quite remember it. She does, however, recall something about the word – maybe the sound of the first letter or a syllable – so she takes, from the pool of her known vocabulary, a name that sounds similar and uses that instead. The result is incredibly large amounts of cuteness. Because she’s three. And the range of her vocabulary is understandably limited. If her mom, or even her 9-year-old sister had this problem, though, the word “cute” would not apply! When we first receive Christ into our lives and begin growing in our relationship with Him, it’s understandable that we might make similar mistakes. That when we think about who God is or what He is like, we would only be able to retrieve ideas from our limited pool of human experience. We take what we have known and seen to be true in this world and, many times, mistakenly assume He must work the same way. There just isn’t much else to choose from! But as we grow in our faith and are exposed to more and more of the truth about Him, our vocabulary expands and now His Word should become the pool from which we retrieve our thoughts about Him. I’m amazed at how often, over twenty years into this, I still limit my understanding of the ways of God to the way I see things work here. How often I think that because I name a circumstance “impossible”, He must have to work around it Himself. How often I think that because I see a situation as a “disaster”, He didn’t see it coming either. How often I think that because I label a person as “difficult”, He must struggle to love them as well. How often I think that because I call a decision “foolish”, He’s worried about the outcome, too. The problem is that I’m retrieving those “names” from the wrong place. I’m assuming my worldly experiences apply to a God who is not of this world! But if I’m filling my mind on a regular basis with His words from the Bible, the Holy Spirit can help me retrieve those words instead. I remember that He names the impossible an opportunity to show His glory (John 9:3). That He sees the disaster as an opening for Him to pour out His mercy (Luke 8:47-48). That He labels the difficult as living examples of the power of His grace (Luke 19:9). That He calls the foolish a way of surprising us with His ultimate wisdom (John 13:5). Like my three-year-old Anna, I want to know it all – I want to grow up in my understanding of who God is and how He works! But that’s not going to happen if all I ever have to pull from is my limited human vocabulary of experiences. I need His words of truth to be so familiar that they become the ones my mind retrieves, without hesitation, every time. Our students never believe it when we tell them that I was the worship leader on our first SERVE mission trip in 2002. I may have only known three chords and we may have sung the same three songs over and over that week, but I did at one time have some guitar skills. If you don’t know much about this instrument, its musical tones are produced by plucking or strumming strings that stretch from the guitar’s “body” to its “head”. The pitch of these tones varies depending on placement of the guitarist’s fingers on the “neck”. 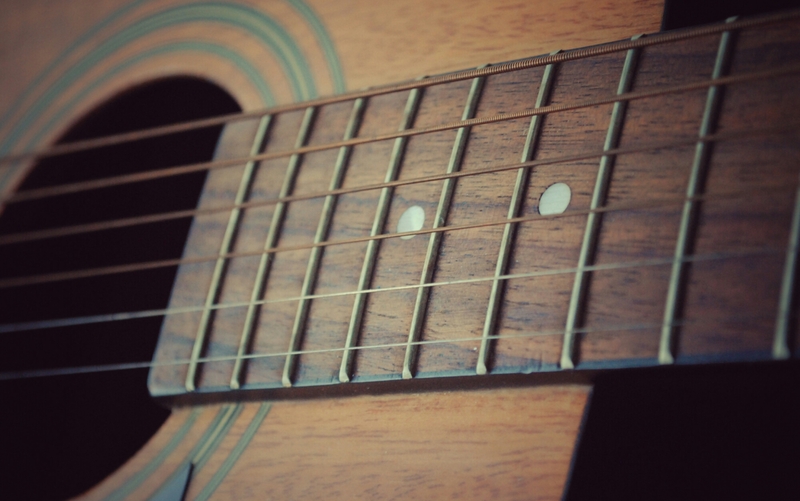 Along the neck of a guitar, you’ll notice these things called “frets”. Frets are metal wires placed at regular intervals which enhance the tone as the string is pressed down against them. As the finger moves from fret to fret, the length of the string shortens, causing the pitch to get increasingly higher. My worship-leading days may be far behind me, but “fretting” is something I am still all too familiar with. It starts with a low, vibrating tone of disturbance. Something in my world isn’t right. Something is threatening my comfortable happiness. When I have lost (or at least fear that I will lose) my comfortable happiness, I fret. I apply the pressure, increase the tension, and shorten my string. I start seeing the possible negative outcomes of this situation. I don’t want any of those things to happen, so I move up another fret into “control-mode”. Because something must be done so that I can have my comfortable happiness back, please. Before I know it, I’ve moved right down the neck, fret by fret, into a full-fledged, high-pitched whine. Things aren’t going my way, I want my comfortable happiness back, and I’m going to make sure everyone in my world knows about it. I’m not sure if stringed instruments were popular in Jesus’ time, but I do know that “fretting” was something He was completely unfamiliar with. As I study His life, I am increasingly amazed at His calm, seemingly unbothered nature in spite of the disturbance all around Him. He knew that after seeing His miracles, people would begin chasing after Him for all the wrong reasons. He continued doing them. He knew that His teaching would be criticized, misunderstood, and twisted to be used against Him. He taught anyway. He knew that He would be harshly judged for His acts of mercy toward “sinners”. He carried on in love. Even with His greatest suffering looming just around the corner, Jesus never allowed the pressure to shorten His string. He didn’t fret into “control-mode” or the “blame game”. His tone remained consistent and therefore His whine was non-existent. So what was His secret? What was it that allowed Him to remain fret-free? The answer is that Jesus did life with an entirely different instrument. Unlike us, the root of His motivation and the foundation of His every action and reaction was NOT comfortable happiness in this life. Instead, it was glorifying God. He knew that the ease and good feelings of this earthly life held nothing in comparison to the glory of the Father, so He based everything on that. And therefore, when the tension increased, rather than fretting into that high-pitched whine, He absorbed the vibration of disturbance and allowed it to turn into beautiful music instead. He allowed the pressure to reveal to the world around Him a deep trust in and deep relationship with His Father. Because of Jesus, that instrument of trust and relationship with God is available to us, too. And I don’t know about you, but I’m so ready to trade up! My friend Emma and I walked along the quiet neighborhood road, talking away, when out of nowhere the web of a giant mutant spider reached out, grabbed us by the face, and almost knocked us off our feet. Seriously, this single strand web spanning over the sidewalk, between a road sign and a tree, was so thick that our foreheads didn’t stand a chance. Maybe it was because we were too focused on each other or too focused on our own feet, but we did NOT see that coming! We’d been clotheslined. As a child growing up in rural Vermont, the clothesline – a length string or rope, usually stretched from a house to a tree, on which clean laundry was hung to dry – was a part of my everyday world. An empty clothesline, however, hung at approximately head or neck level, could become dangerous to an unsuspecting backyard traveler. If you were too busy looking at the ground or at something else around you, you were in danger of catching the line with your face and having your feet thrown right out from under you. The term “clotheslined” has been coined as a move in both football and wrestling where your opponent firmly holds their arm out at neck level in order to stop your forward progress from the top and throw you down onto your back. If you saw it coming, you could adjust and avoid the fall, but the whole point is that you don’t. The surprise is what makes a clothesline a clothesline. In the first chapter of the book of John, we read about this guy, Simon, and his first face-to-face encounter with Jesus. And in this first meeting, Jesus gives him a new name: Peter. Simon, the old self, was no more – now he, as a follower of Jesus, would be the “rock”. The problem was that no matter how much Peter was becoming that leader and solid rock of a disciple, Simon kept showing up, extending his arm and taking him down. And he never saw it coming! Here comes Simon with that outstretched arm of doubt and suddenly he’s sinking in a swarm of wind and waves. He did NOT see that coming. Here comes Simon whispering the lies that his plans for Jesus were greater than God’s. Resulting in Jesus temporarily renaming him “Satan”. He didn’t see THAT coming either. Here comes Simon, arm out, aiming directly for the neck. Peter’s confidence bows to his fears, he denies even knowing Jesus, and the “rock” is now a pile of shattered pebbles. Luke 22:62 says that when Peter realized what he had done, he “wept bitterly”. But, John 21 describes a beautiful scene in which the resurrected Jesus gently picks up that pile of pebbles, looks Peter in the eye, and reminds him that He would never give up on him. Those clothesline-style attacks may have surprised Peter, but they didn’t surprise Jesus at all. He knew that Simon would show up, He knew that Peter wouldn’t see it coming, and He knew the end result. But He also knew that Peter needed those reminders that it wasn’t about how rock-solid he was – it was about how rock-solid the One he had put his faith in was. And I feel like I’ve betrayed myself. I feel like I’ve let Jesus down. I feel like I’ve hurt my family, friends, or even a total stranger (yep, that happened). I feel like there’s no hope for me, because I NEVER thought THAT would happen. But then the even stronger arm of Jesus reaches out and I get clotheslined yet again – this time by grace. His unfathomable mercy takes my feet right out from under me. And then He gets the amazing opportunity to reach out His hand, say my name, look me in the eye, and remind me that He’s never giving up on me. Even though Emma and I’s “clotheslining” happened more than a decade ago, I still remember it vividly every time I drive through that part of town. The memory of our falls may always stick in our minds (especially the epic mutant ninja spider ones), but it’s not to condemn us or scare us into being more careful next time. They’re there to remind us that it’s not about us – it’s not about how strong we are or how perfect we’ve been – it’s just all about our rock-solid God and His never-ending grace toward those of us who are simply willing to accept it.